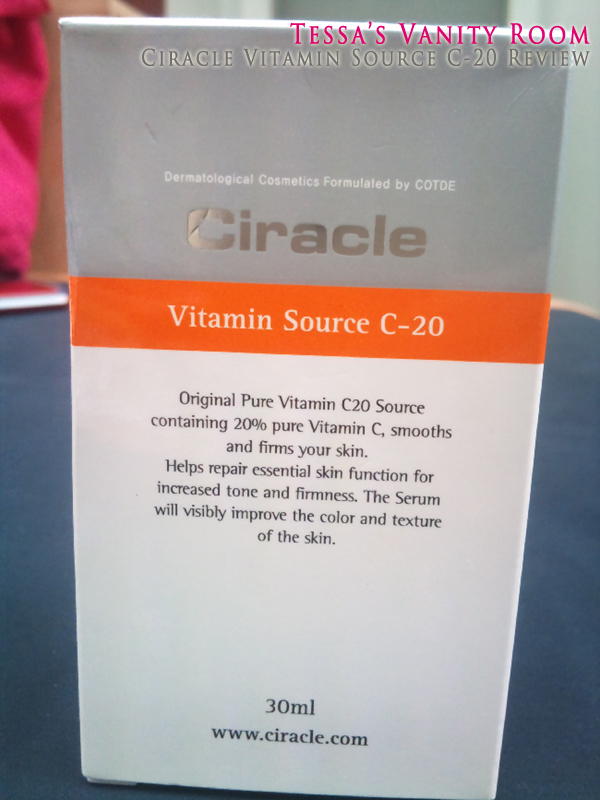 Ciracle Vitamin Source C-20 ($48.99 for 30ml) is a serum richly concentrated with vitamin C. It contains 20% of L-ascorbic acid, which is a high quality PURE (not compounded or derivative—which can cause skin irritation as a side effect) vitamin C and a powerful antioxidant. This helps rejuvenate the skin, giving you a brighter and healthier glow to the face. Overall the product contains 6,000mg of vitamin C, which is equal to 40 oranges or 120 strawberries. 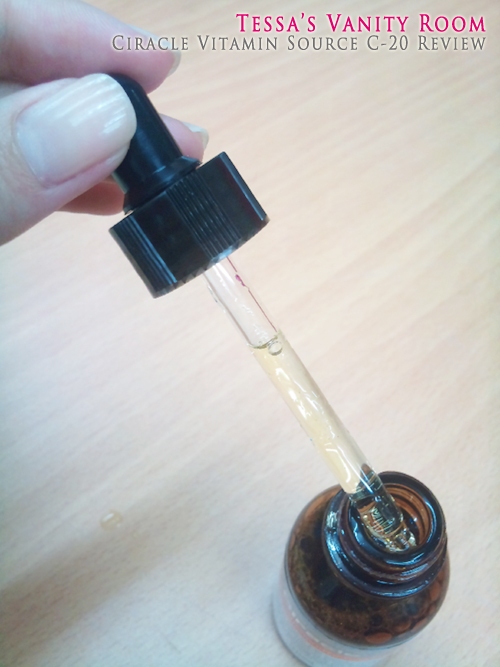 The bottle has a cap with a syringe that helps you squeeze out precise amount of drops without over-pouring the product. The product itself is clear type, and the viscosity is quite fluid. 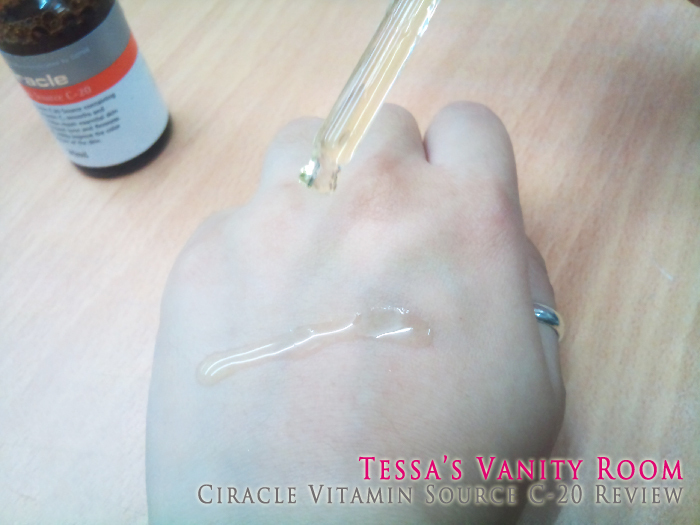 This vitamin serum is another well-made product for special skin care treatment along with Ciracle Pore Control Blackhead Off Sheet and Ciracle Jeju Volcanic Clay Mask. Initially it may seem redundant to have so many different products—blackhead off sheet, clay mask, vitamin serum—that claim to do similar things. However each have their primary reason for existence. Blackhead off sheet is mainly for removing blackheads. Clay mask is mainly for purifying and tightening pores. Vitamin serum is mainly for rejuvenating the skin and brightening the skin tone. Using more than one product can give you better results. However those with sensitive skin should be careful in using more than one product at the same time as it may remove too much skin cells and irritate the skin. In this case, using the products alternatively on different dates can help. Initially the product comes in a box with the bottle with a cap and a separate syringe cap. Throw away the bottle cap and replace it with the syringe cap. Wash face and tone the skin with toner. Squeeze 2 to 3 drops of serum either directly on to the face or on the back of your hand then lightly pat it all around the face. You can use additional amount for dark and/or saggy areas. First time user may feel a tingling sensation. This is normal as it due to the pH adjustment of the skin. The serum has a bit of viscosity. 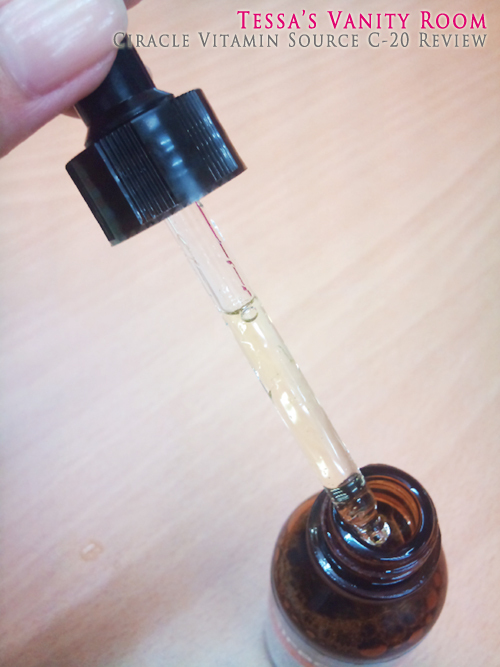 To lessen the gooey-ness, you can mix the serum with toner in your palm then apply it on to the face. Afterwards apply your moisturizer and do your daily skin care routine. Refrigerate the product for longer lasting freshness. Because the product is a highly concentrated with pure vitamin C, it is recommended to use the product as quickly as possible once opened. Vitamin C is sensitive to heat, light, and temperature. So always store it in the refrigerator even before opening the product. If you use the product during the day, remember to wear sunscreen lotion since your face is more likely to be sensitive to sunlight after using the product. There may be residue or settlements on the bottom of the bottle or around the opening area. This is due to the high concentration of vitamin C and is natural so nothing to worry about. Also the product turning brown is natural; same way how a bitten apple turns brown. You won’t see immediate results on the first time. Though, use it everyday for a week to a month then you will see the difference in skin tone and firmness. The major issue to this product is USE IT AS FAST AS POSSIBLE. We women have the urge to save expensive products to let them last longer, but for this one that’s a no-no. The UV rays will break the vitamins and thus the product will be less efficient over time—another reason why you should use the serum at night rather than daytime. I used the products directly onto my face without diluting it with toner. I had to use more than 3 drops—around 5 to 6 drops. I have freckles and spots on my face, so I used more on those areas. I will later post picture of my before and after! Tip: I did not sense any tingle even when using the product for the first time. However, I have seen others who say they constantly feel the tingle. If the tingling feeling keeps occurring even after several usage, it may be that your foam cleanser has a high pH, which is not good for your skin (the skin’s pH should be slightly acidic to neutral, about 6 to 7 pH). Try switching to a more gentle foam cleanser.